At a recent meeting of the Board of the Radnor Historical Society, your columnist listened to plans made by a neighboring historical society for the presevation of landmarks in its area. This area is one so close to that of our own community that it would seem to be almost as much our concern. With the thought of aiding the splendid work now being undertaken by the King of Prussia Historical Society, of which Dr. Robert D. May is president, the writer is devoting several issues of this column to the story of what this group is undertaking in Valley Forge Park area. 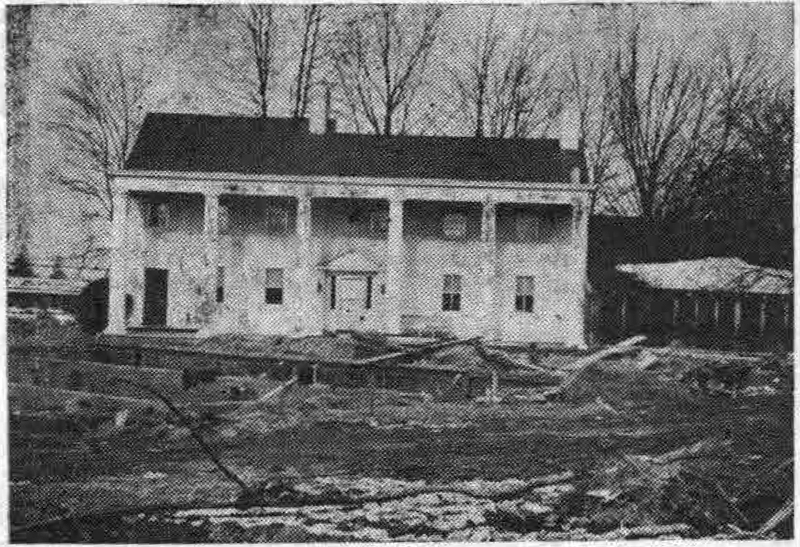 The material prepared by the society is all the more interesting, in that it includes pictures of several old houses well known to many readers of this column. “Surrounding Valley Forge Park is an area rich in early American history. Many of the original buildings that quartered American and British troops are still standing. Because of the rapid growth of the communities in this area, many are slated for early destruction to make way for factories and sub-divisions. Some have been abandoned because of the proximity of the Pennsylvania Turnpike and the Schuylkill Expressway link through this historic area. Since the King of Prussia Historical Society, new as it is on the roster of nearby local organizations of its kind, believes that “we can all learn for the future by a study of our past heritage,” they are carrying out definite plans for that future. These include a survey of buildings in the general area of Valley Forge, the photographing of these buildings and the making of architectural measurements and drawings. This is being done by a survey crew working in the evenings and on weekends. And since rapid expansion in the Upper Merion area “threatens everything old,” plans are also being made to catalogue and evaluate buildings in respect to their historic importance. This will help the order in which efforts for future preservation of such buildings should be made. 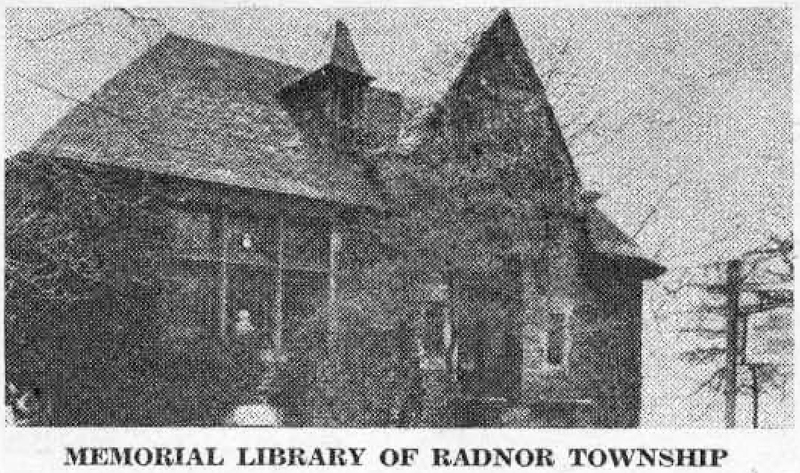 Since the story of libraries in Radnor township was started in this column several weeks ago, pictures have been shown of four of the buildings, which have housed them in the past. In choosing today’s picture, the one shown below has been selected for several reasons. The main entrance to the library shows on the left as opening, at the top of a short flight of steps leading from the ground floor door, into this main corridor. Directly opposite the entrance is the librarian’s desk where incoming books and phonograph records are received and others given out. Beyond can be seen the many-windowed section of the library used as a reading room for its younger members. Another well-lighted room in the basement floor is known as the Veterans’ Room. Although dedicated to the use of the veteran organizations, it is also used from time to time for meetings of other community groups. The story of the erection of this beautiful permanent home for the library is such a recent one that it need not be retold in detail at this time. In 1946, the feeling of the community, that there should be a lasting memorial materialized in plans for a much needed addition to the small building on West Lancaster avenue. This idea, first sponsored by the Wayne Business Association, was adopted with whole-hearted enthusiasm by those interested in a permanent memorial. A well organized campaign is now under way to pay off the $7,000 mortgage on which interest has been paid since 1949. In view of the phenomenal growth in the use of the facilities of the new library since its completion seven years ago, the success of the campaign is almost assured. According to figures recently compiled, the library registration increased from 1,797 in 1948, the last year of the George W. Childs Library, to 5,918 in 1955. Book withdrawals in that same period had increased from 24,804 to 104,332. This represents a 400 per cent increase in utilization. 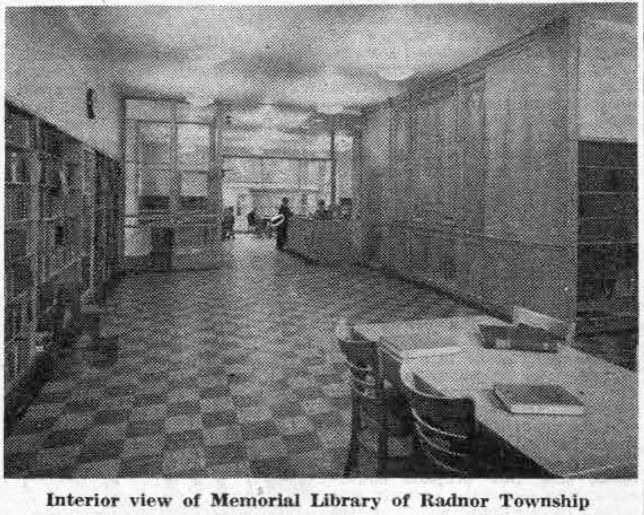 Surely Radnor township chose wisely when it selected the building of its Memorial Library as its living tribute to its dead of World War II. Since this series on the history of the Memorial Library of Radnor Township was started several weeks ago, the woodcut shown above of the place in which the library was founded, in 1809, has been lent to this writer. 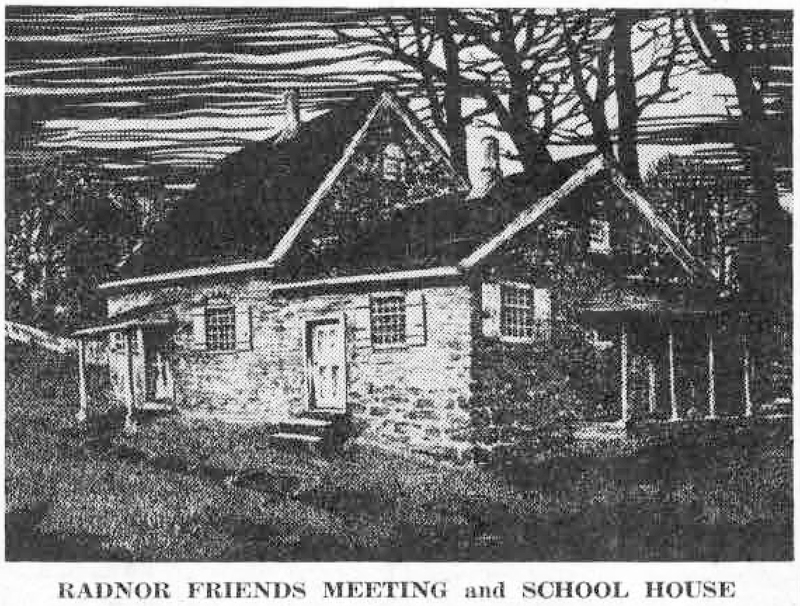 It pictures the old Radnor Friends’ Meeting and school house, as it looked when it was built in 1719. A present day member of Radnor Meeting tells us that this “school house “ is the portion of the building to the right, with the small wooden door leading into it. The second picture shown with today’s column is that of the Wayne library, built on West Lancaster avenue in 1893, on ground donated by George W. Childs, of Philadelphia. Mr. Childs had many real estate interests in the newly-developing community of Wayne in the closing years of the 19th century. Mrs. Hunt’s records tell the amusing story of how the library books were moved – by wheelbarrow – from their former second floor quarters at 105 North Wayne avenue to their new home on West Lancaster avenue. Miss Nathalie de Canizares, then assistant librarian, helped by Edward Kirk of West Chester, who offered his services in the good cause, transported all the books in this manner, which must indeed have been a tedious one, even in the days when Lancaster pike traffic was entirely horsedrawn. The actual moving of the books once accomplished, the matter of their arrangement was next in order. In previous locations of the library this had been done alphabetically on the shelves, according to the name of the authors. Now books were catalogued according to the Dewey-decimal system, and arranged in proper categories, such as fiction, poetry, reference, etc., under the direction of Miss Isabella Lord and a Miss Hopkins of Bryn Mawr College, whose services had been obtained for this purpose. The library continued to function under this set-up, until the number of its books outgrew its stock space. In 1928, a donation of $3,000, given to the library by Miss Anna Markley, made possible an addition to the building in the form of a new room, which was set aside for the use of children. Mrs. Margaret Wendell Hess, with her gift for interesting young people in reading, was for some years in charge of this room. Her ”story hour” for children is still held in fond remembrance by many adult members of this community. It was through Mrs. Hess that the late Frederick F. Hallowell established the Nancy Hallowell Memorial Fund, following the death of his daughter. Since that time, the interest from the bonds which formed the donation has been used for the purchase of children’s books. With so much emphasis now placed on the juvenile section of the library, the service to children and young people has been increasing steadily ever since.